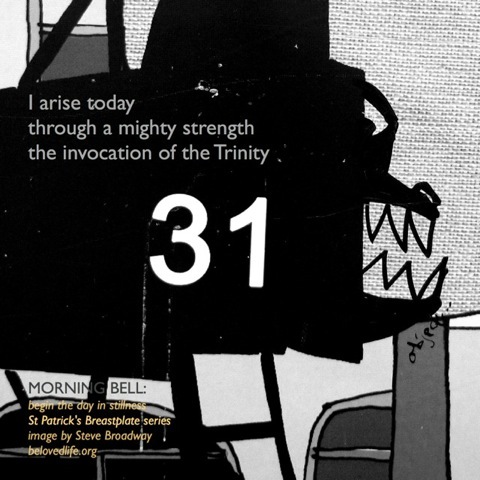 The new series of morning bell beginning 10 February is a daily meditation on part of the prayer or hymn known as St Patrick’s Breastplate and attributed to the great Celtic-era saint Patrick. In these much-prayed and long-pondered words there’s a striking sense of the challenges of being human in an unpredictable world – and of the goodness of God. The images for the series are by photographer and artist Steve Broadway – our second collaboration on Morning Bell. All the images were taken at Bristol harbourside, close to where Steve lives. Steve posts a daily drawing, artwork or photo at One Day Like This.